• No laughing. At least not out loud. • Reserve judgment until you have reached the end — something that's difficult to do when the subject involves hunting with poodles. Ha! Caught you already. Guilty on both counts. Before anyone rips a rib, it must be established that poodles as valued hunting partners is a serious matter, certainly to a Loveland woman who has been breeding poodles for 50 years, the last 15 for the chase. "Poodles were the original hunting dog, brought to Eastern Europe from Asia. They just took a wrong turn when they came to the U.S.," said Eileen Jaskowski, among a handful of breeders determined to set the direction straight. This may seem a strange quest to anyone whose perception of poodles starts with velvet cushions and ends with rhinestone collars. But Jaskowski is dead serious — as illustrated by an excited dog with a mallard clutched in its teeth. "People like myself have begun to bring them back over the past 20 years," said Jaskowski, a diminutive woman with a perpetual twinkle in her eye. "We've been able to get them into hunting tests, which is a big achievement." What confounds Jaskowski is that poodles aren't yet accepted for official field trials and that the American Kennel Club classifies them in the nonsporting group. "A lot of professional trainers are interested, but there's this one man standing in the way of official trial status. He told me flat out that no woman with a poodle is going to play in his game. "But we will eventually. I'll outlive him if I have to." Jaskowski scored a major breakthrough when the Poodle Club of America embraced the notion of placing dogs in the hunting field. "They took me into their hallowed ranks," she said. "They decided the breed should return to its ancestry for those breeders who want to." For now, Jaskowski is content to solidify the breeding line at her Lone Tree Kennel, steadily winning back the natural hunting instincts that all those years of pampering squeezed out. "I searched until I found a good dog," she said. "A breeder who had no idea poodles could hunt or retrieve or anything sent me a dog that had a world of desire." That dog, called Pie, still is alive as patriarch of a increasingly keen line of field dogs that improves with each generation. The journey hasn't been easy. Jaskowski has heard her share of poodle jokes. "Too many," she said good-naturedly. "At first, the laughing started when I got out of the car. By the time I got back to the car, there was no more laughing. "I've definitely had to pull my weight, considering my age and gender and what my dogs look like. Nobody cuts me any slack." Poodles are used mainly for retrieving, and it must be reported that they perform best in warmer climes. To this end, Jaskowski transports her gaggle of dogs each winter to a place near Houston, where they get lots of action in water well above the solid state. On an outing in early January, when ice islands formed in the South Platte River north of Denver, one male poodle carefully measured the depth of the water relative to his private parts, then refused to retrieve a duck; another happily splashed in to grab it, as pleased and proud as any Labrador with a duck in its mouth. In many cases, poodles as hunters still are a work in progress, but Jaskowski is determined to keep the process going. "I think of it as trying to save the breed. It won't be worth much until it can prove its value as workers," she said. "We're making headway. I hope it can happen before I croak." Peyton Manning has no use for your questions about rest or bye weeks or injuries. None. 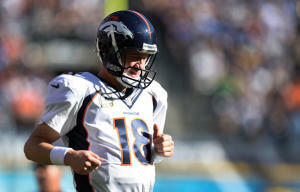 Broncos Mailbag: Is Super Bowl title in cards for Peyton Manning & Co.? LOS ANGELES (AP) — A Southwest Airlines flight landed in Los Angeles with one more passenger than when it took off.